If We Assume: How Long Between Apple Releases? 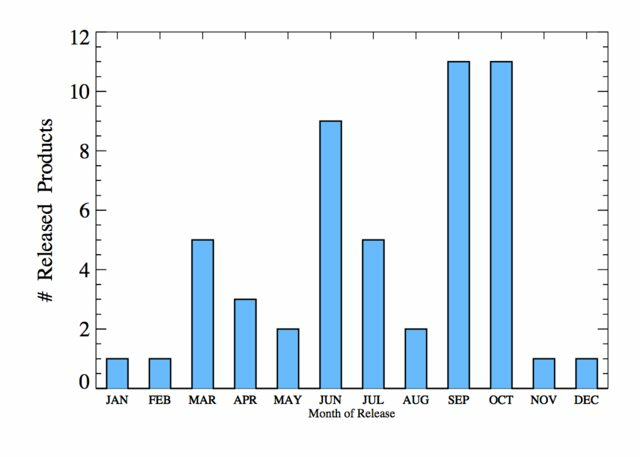 How Long Between Apple Releases? As an Apple computer fan I've been a long time reader of Mac Rumors, a website that reports great Mac news and rumors. One great feature is their Buyer's Guide, which tracks the refresh history data (and rumors) to suggest when products are due for an upgrade. 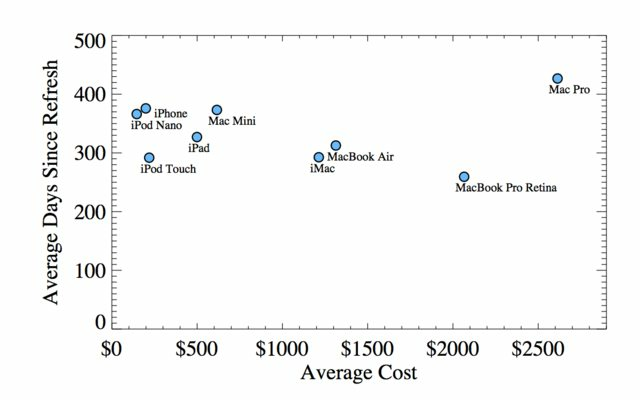 I've been wondering if a) Apple products are actually getting cheaper over time, and b) if Apple is refreshing products faster? Some products change in price quite a bit, most don't. The refresh timescales also move around quite a bit. This of course makes sense: computers and tech are big items for Back-To-School sales. 2. MacBook Air keeps getting better! 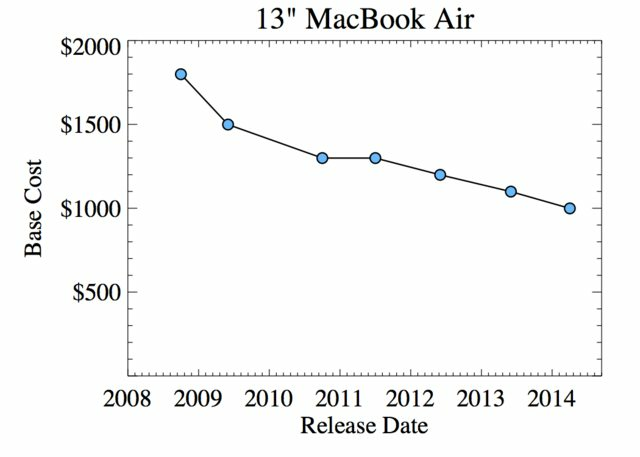 I've long held that the 13" MacBook Air is by far the best laptop Apple makes, and it's one of the only products that show a continuous decay in price. The Air has steadily transformed from a niche high-end portable to the standard entry-level laptop! 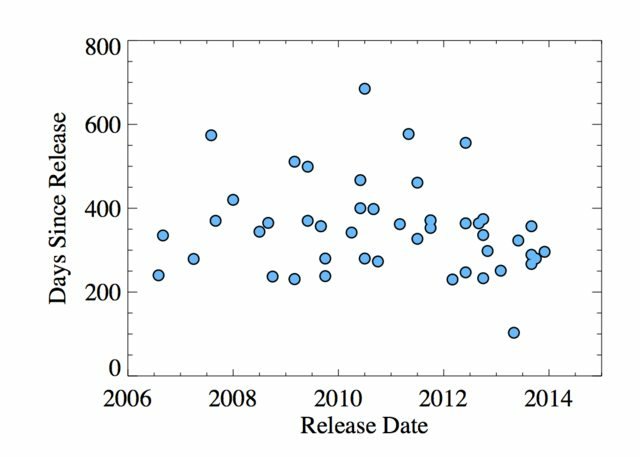 This isn't a highly significant result, but it's interesting that release timescales in the last 2-3 years have started to converge to a slightly lower span. ... except for the Mac Pro, which is the most neglected Apple product usually. 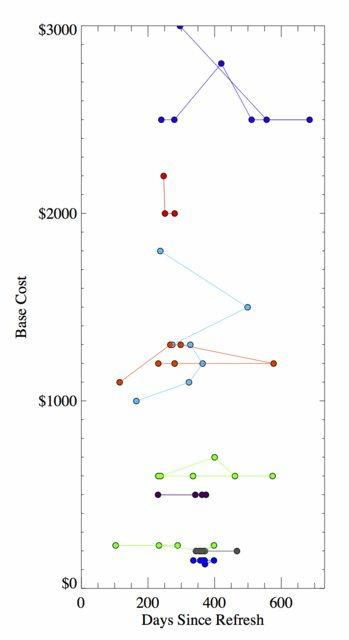 This result was very counterintuitive to me, I figured there would be more volatility in the lower-price products and thus shorter refresh timescales. This "trend" is driven by the rapid refresh times of the Air and Retina laptops.